MOSCOW, Feb 21 (Prime-Tass) — A couple of weeks ago at our conference in Kiev, I talked politics with my cab driver. We agreed that the outlook was bleak. March elections looked likely to produce an unstable coalition government led by one of a range of equally unsavoury potential Prime Ministers. But, I suggested, unlike Russia, at least Ukraine had democracy. The people had earned the right to choose through their courage and determination during the Orange Revolution. The taxi driver nodded his agreement. I said that no matter what the short-term issues, in the longer term, democracy was a much more secure political foundation than the authoritarianism towards which Russia was tending. The driver said that he was no fan of Putin. Perhaps partly in the hope of a lower cab fare, I said that being British I could assure him that Ukrainians stood a good chance of eventually becoming part of the EU. My driver said that Ukraine was, and always would be, a European country. We drove in silence for a while. ‘But’, he said, ‘what Ukraine needs right now is a candidate like Stalin who can come in and shoot all the thieving bastards in government’. He then charged me the exorbitant price of Hr25. Ukraine is in the early phases of democracy. The country’s near term political success will depend on whether the current instability is the consequence of democratic teething problems, or is fundamental enough to undermine the concept of consensus government altogether, as happened in Russia after the nineties. Given the underperformance of Ukrainian equity over the last six months, the type of regime that emerges post March 26 elections will also determine whether there is a sharp period of catch-up, or whether Ukraine will slide along in the doldrums. If a coalition government emerges post elections that must struggle to build compromise through the infighting of various lobbying groups, then that is simply democracy at work. It might look ugly, but as long as each power group feels that they have the potential to influence government, then politics is essentially internalized and will tend over time towards stability. If, however, the differences between factions prove so great that no coalition is able to compromise enough to govern effectively, then the result could be the sort of anarchy that forces interest groups to look for solutions outside of the existing constitutional framework. Given the precedent of the Orange Revolution, the temptation exists to try the experiment again – a risky strategy at any time, but particularly when Russia is feeling more assertive over the near abroad. Unfortunately, Ukraine has a number of elements that do not bode well for successful coalition government. There are at least three axes around which differences are irreconcilable enough to challenge stable government. First, there is the split between West and East. Historically, culturally, economically, even linguistically, Ukraine splits down the middle through Kiev between the Russian speaking East and the Ukrainian speaking West. 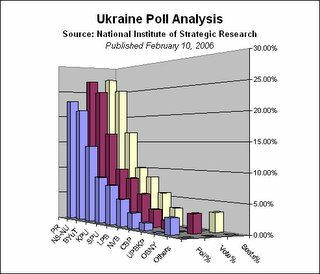 In polls on everything from support for Ukraine’s European aspirations to attitude towards democracy, the best predictor of preference is the geographical location of the poll. Second, is the relationship with Russia. Viktor Yanukovich, leader of the Party of the Regions faction, one of the three main contenders in the March 26 elections, is openly standing on a platform of support for Ukraine’s future with Russia. Of the leaders of the other two main factions, Yulia Tymoschenko has an arrest warrant out for her in Russia, and the other, President Yushchenko, has frequently suggested that the Russians have tried to poison him. While foreign policy is an electoral issue in many countries, it is rare for the gap to stretch from mentor and sponsor to jail and assassination. Third, there is the difference between those on the inside of Ukrainian power and those on the outside. Until the Orange Revolution, most of Ukrainian politics and business was dominated by a small clique who shared power and split the economics. Controlling both politics and business, insiders were virtually impregnable to anybody outside wishing to exercise influence through the existing power structure. The popular frustration following the electoral manipulation in late 2004 was what catalysed the Revolution. While that episode broke the monopoly on power, it has not ended the enmity. Much of the politics of the last year has been about the old power clique clinging on to their assets and the new attempting to wrestle them free. The elections may redraw the battle lines, but they are unlikely to end the fight. So are the factional differences simply too great to permit the formation of a stable government? Is Ukraine doomed to unstable government until a single party is able to dictate stability from the top, much as the Kremlin has decided is necessary for Russia? This time last year, in the afterglow of the Orange Revolution, I was highly enthusiastic about Ukraine’s prospects – in fact, so enthusiastic I bought a rather expensive apartment in Kiev, unfortunately after a Revolution inspired 30% jump in prices. Now, one difficult year wiser, I am certainly more sanguine, but still remain reasonably confident that Ukraine will prove successful. While there may be issues over which universal agreement is all but impossible, on many of the most fundamental questions, there is broad agreement. All of the three main factions believe that economic growth is crucial, and that private business is the best way to generate it. There is also broad agreement on the need for private property and a stable legal regime in which to operate. Similarly, the lessons of the nineties have made classical macroeconomic stability conventional wisdom across the political spectrum. To be sure, there are many disagreements on rather important details – including how much state subsidy is needed to encourage private business and from when exactly property should be considered private. But the examples of Eastern Europe and Russia have illustrated the power of economic growth and the role that private business has to play in generating it. A government based on open conflict may well take considerably longer to reach agreement on those important details, but equally there is a lot less scope for either the wrong decision being reached or for a decision taken on behalf of one particular inside group. Much has been made of the disappointing corruption scandals that have emerged within Ukraine’s Orange government. But, on the other hand, at least they emerged and did damage. In a number of other regimes bordering Ukraine, corruption stays submerged and encourages ever more ambitious projects. Moreover, consensus government, for all its many faults, does at least provide a voice for each of the interest groups. Ukraine would have its irreconcilable issues whatever the form of government. If one party dominated government then it might be able to dictate stability for a while, but other factions would be left with no choice but to attempt to bring down government and establish their own period in power. Hardly a recipe for long-term stability. Indeed, given the entrenched factionalism in Ukrainian politics, the sort of coalition government likely to emerge after the March elections is perhaps the only form that has the chance to achieve some kind of longer-term balance. At this stage, the most likely outcome of the elections appears to be a coalition government formed between Viktor Yuschenko’s Our Ukraine and Viktor Yanukovich’s Party of the Regions. This time last year, a partnership between the heads of the two parties that fought the Orange Revolution would have been unthinkable. But the exigencies of government have forced the two sides towards cooperation. If a government is indeed formed between them, it will doubtless prove highly conflictual and may well break down. But what the Orange Revolution and its aftermath has shown is that neither side is able to govern for long alone, and that some sort of cooperation is necessary if the longer-term goal of a more stable, wealthy, powerful Ukraine is to be achieved. And that cooperation, is what a consensual, democratic government, for all its faults, is best able to achieve. The remarkable global appetite for risk, the strength of Russian equity so far this year and the number of Ukraine dedicated funds that have emerged in recent months may well mean that Ukrainian equity will look attractive in the aftermath of the upcoming elections. My taxi driver and I may have been united in our bleak outlook for Ukrainian politics, but we were also equally united in our hope for a stable business environment in which to increase our incomes. He had been one of those dedicated drum bashers the previous year who had kept up a 24/7 racket outside government. His desire to murder the resulting personnel was not your ideal democratic response, but it does illustrate the level of frustration with the stand-off that has frozen government for the last 12 months ahead of the March elections – possibly exacerbated by several weeks standing in the snow banging a drum. While the coalition that will likely emerge will not exhibit the unchallenged cohesion of Putin’s Kremlin, it could well prove to be better than both the current incumbents and the pre-revolutionary monopoly. Please note that opinions contributed to Prime-Tass are not edited. If you would like to contribute your opinion, please send an email to: engeditor@prime-tass.com. With just over five weeks before parliamentary elections are scheduled to take place, political blocs are trying to figure out how they are going to create a majority in the new legislature. According to recent polls, 2004 presidential candidate Viktor Yanukovych’s Party of Regions is ahead, followed by President Viktor Yushchenko’s People’s Union Our Ukraine and the bloc of former Premier Yulia Tymoshenko. Even though analysts say it is hard to tell exactly which factions will form a majority after the March 26 election, one thing is clear: if a coalition is to be established, it will have to be a configuration which includes at least two of the above three blocs. According to Ukrainian legislation, the new parliament will have to form a majority of at least 226 seats within a month after the elections. Otherwise, the president is entitled to dismiss the legislature. Analysts say, however, that deputies will likely try to create a majority closer to 300, or a constitutional majority. “None of the parties are going to get 226 seats in the parliament,” said Ilko Kucheriv, the head of the Democratic Initiatives Foundation. Based on the results of recent polls, several configurations of the future parliament are possible. The first one is “Orange”, represented by Our Ukraine, the Yulia Tymoshenko Bloc, the Socialist Party and the pro-presidential PORA-PRP. It remains unclear whether the latter has a chance of making it over the three-percent barrier. The “Blue” variant is a coalition of the Party of Regions, the Communist Party, the fiercely anti-Yushchenko Ne Tak bloc and the bloc of radical leftist Natalia Vitrenko. Again, the last two are not likely to get enough votes. While speculation abounds, analysts say it’s unlikely that any kind of ideology based coalition – be it Orange or Blue – will be created. Kost Bondarenko, director of the Institute for National Strategy, agrees, adding that former Orange allies still have a lot of axes to grind. “Tymoshenko will try to ‘privatize’ Yushchenko, and his current allies will not like that,” Bondarenko said. Tymoshenko served as Yushchenko’s Prime Minister until being fired last September. “This is hardly going to be a pro-presidential coalition,” Bondarenko said. But a blue coalition is equally improbable, according to analysts. The Party of Regions would have to negotiate conditions with the Communists and the bloc of parliamentary speaker Volodymyr Lytvyn. Smoothing out conflicting ideologies between these three groups would be difficult. Analysts claim that the most probable alliances are between the Party of Regions and Our Ukraine, or the Party of Regions and the Tymoshenko bloc. Smaller players like the SPU or the Lytvyn block may figure in. Evidence of coordination between the Tymoshenko and Yanukovych camps surfaced earlier this year, when factions in parliament loyal to the two popular political leaders voted to oust the government of Yuriy Yekhanurov over a controversial gas deal inked with Russia during the New Years holidays. While it remains unclear if the vote was legal, political analysts claim it is proof that a bond is possible between Yanukovych and Tymsohenko. According to Bondarenko, the basis of such a coalition will be the desire of both political forces to revise the privatization process. A coalition between Our Ukraine and the Party of Regions is probable too. Analysts say this type of union will heal the split between the east and west of the country and bring balance back to politics. Whatever its composition, some kind of majority will be formed before the 30-day deadline, analysts say. To do otherwise would risk dismissal and a greater role played by the president. Socialist leader Oleksander Moroz says that whoever forms a coalition, they will likely have to negotiate with him. And he may be right, according to Bondarenko, who said that Moroz holds the “golden share” with an expected eight-percent of all votes. Moroz will be very cautious about joining up with any other political parties for now. Yermolaev recalled that the Socialist leader’s political rating dropped after he supported Orange politicians during the 2004 presidential election. MOSCOW. (Yevgeny Kozhokin for RIA Novosti.) – Today Ukraine is facing several serious challenges at once. The first, in the domestic politics, has been brought about by the country’s political reform, which has transformed the form of government from a presidential and parliamentary republic into a parliamentary one since January 1, 2006. The question arises whether Ukraine’s diverse political forces will be able to find a stable compromise and form an efficient and professional government after the March parliamentary elections. Other challenges, both in domestic and foreign policy, reflect the split in society and the elite, when one part of Ukraine strives for a fast Euro-Atlantic integration, while the other chooses the opposite, eastern direction. The constitutional reform eliminated the country’s previous institutional system, which is typical for most post-Soviet countries. The main advantage of the transformation is that the new model provides better guarantees against temptations of creating an authoritarian regime. However, it can plunge the country into a series of political crises, with poor or absent governance. Stable and well-governed parliamentary systems always have established party structures. Britain is an example of one of the most efficient parliamentary democracies with stable, long established parties. Ukraine, on the other hand, will need a long time to develop a relatively stable party system. Today Ukrainian parties come and go to be replaced by new ones. The party chaos is a very serious challenge for Kiev. Polls show that about 27% of the electorate is willing to vote for the opposition Party of Regions led by former Prime Minister Viktor Yanukovich, 20.2% for Yulia Timoshenko’s bloc and 11.4% for the pro-presidential People’s Union “Our Ukraine.” Other parties that stand a fairly good chance of making it to parliament are the Socialist Party of Ukraine, which enjoys the support of 5.7% of voters, Natalia Vitrenko’s bloc “People’s Opposition” (4.8%) and the Communist Party (3.7%). It is possible that a number of other less popular parties will also gain seats, as their present rating is around 2%, and the cutoff is very low at only 3%. So the new parliament may have a highly complex composition. If the election were held next Sunday, the Party of Regions would get 145-155 seats, Timoshenko’s bloc 123-133, Our Ukraine 60-70, the Socialist Partyof Ukraine 25-35, People’s Opposition 20-30, and Communists 15-20, with the total number of seats being 450. There is no doubt that when the poll takes place on March 26, none of the parties will get a sufficient number of seats to form its own majority government. Consequently, the winners will have to form a coalition, uniting with their former opponents who they do not trust and expect to act unpredictably. Will the finalists of this tough race be able to find a long-term compromise? Without an answer to this question it is impossible to forecast what approach the official Kiev will adopt toward the other challenges, notably Ukraine’s intention to join NATO and the European Union. The present “orange” leadership has repeatedly stated its position, voiced by acting Foreign Minister Boris Tarasyuk, who said that Ukraine would definitely work toward joining the organizations. NATO membership is certainly in the interests of Ukraine’s bureaucracy, including military bureaucracy, and some generals and commissioned officers are already contemplating what positions they will be able to take in the Alliance, how their children will go to the NATO college in Rome and how much they will earn in Brussels. They are tempted by the prospects that can open up before them after accession to the military bloc. Their motivation is very strong, because Ukrainian military can see how their counterparts in Slovakia, Poland and Hungary have benefited. It should be noted, though, that not everyone in the military and security establishment supports the accession. The Ukrainian Security Service and other departments understand that joining NATO will mean cleansing their ranks. However, there is another side to the accession issues that touches upon the interests of many more people. It is the issue of the future of Ukraine’s defense industry, which has important links with Russia and Belarus. Ukrainian enterprises receive a significant amount of components from Russia. The weapons they produce comply with former Soviet standards because they were designed before the Union’s breakup. So the Ukrainian defense industry is unlikely to survive the country’s NATO membership. The West is not at all interested in preserving a strong rival. So the issue will be less political than purely economic. Despite its huge profits, the weapons market is very limited and rivals are ousted by tough methods. As soon as Ukraine loses at least part of its sovereignty in military and industrial policies, it will come under extreme pressure, including purchases of its defense companies to shut them down. This will reduce the number of jobs. Russian companies will have to give up cooperation with their current Ukrainian partners out of security considerations. The accession issue, therefore, is not only military and political but also social and economic. Ukraine’s accession to the EU is not on the agenda, which European officials have repeatedly said. This is a matter of distant future. Today Ukraine is preparing for a long wait, becoming Turkey’s rival. However, Ankara is at an advantage because it has already launched official accession talks. One can object that although Turkey is moving toward Europe, the final result is still uncertain. This is true, but the very process impedes Ukraine because the European Union will obviously not be able to admit two large countries whose economies, social structures, legislation and security forces are so different from those of its key member states. Besides, their aggregate population is 120 million people (70 million in Turkey and 47 million in Ukraine). Their simultaneous admission would threaten to drastically reduce the EU’s living standards and even plunge it into a deep recession with unpredictable consequences. Today Ukraine is following the path chosen by Hungary, Poland, the Czech Republic and Slovakia in the early 1990s. At that time, politicians in these countries actively debated whether it would be best to stay out of NATO and the EU. For Poland, it was a unique chance to become a country with great influence in Europe. Just imagine that today, with all the present difficulties and challenges, there would be a large democracy in Europe that would not be part of any bloc and would be carrying out its independent policies. Every one would be struggling to establish good relations with such a country. This would give it constant practical benefits because competition for its loyalty would be accompanied by huge economic concessions. This scenario for Ukraine’s neutral and independent development would promote stability in Eastern and Central Europe, but it is not endorsed by the people in power who are afraid of being responsible for their country’s fate. Yevgeny Kozhokin is director of the Russian Institute for Strategic Studies. Please Note: The poll has an undisclosed balance of 14.8% if this balance is infact allocated to minor Parties then the NVB and OBNY Bloc’s would not achieve the minimum 3% requirement, in which case their allocated 29 seats would be redistributed and the extent of wasted vote would exceed 20%. Ideally the poll should publish more information as to the outstanding balance and if the nominated percentage is the percentage of voters who will be casting a valid vote or it is a percentage of those polled. Additional information that would assist in the analysis of the vote would be a copy of the questions asked and geopoltical statisical data (ie a breaks down of the number of respondents from each oblast)Without this information each poll is like comparing apples with oranges. With the quailty of each orchard grove varing significantly in output. Please Note: The poll has an undisclosed balance of 15.4% if this balance is infact allocated to minor Parties the fact that no additional party/bloc achieve the minimum 3% requirement the percentage of allocated seats would not change. 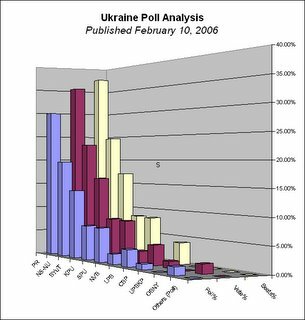 You are currently browsing the Ukraine Today blog archives for February, 2006.